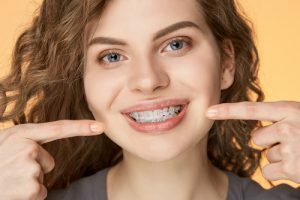 If you have a teen who isn’t looking forward to a year or two of wearing youth braces and making visits to their Philadelphia orthodontist, there are some details about orthodontia that can help them feel better about what’s ahead. Your teen might roll his eyes at any story that starts with, “Back when I was young…” But braces are very different than when you were a teenager. Modern conventional braces have smaller brackets. You can get ceramic braces that are hardly noticeable. Invisalign aligners are nearly invisible. 2. You might be able to wear Invisalign. 3. It won’t be as bad as you imagine. If a teen underwent interceptive orthodontics as a child, their adolescent orthodontic treatment may be simplified, shorter, or potentially unnecessary. Your orthodontist knows the most effective method for addressing your misalignment. They want you to be motivated to have successful orthodontic treatment and do everything possible to minimize discomfort and embarrassment. 4. You’ll have healthier teeth. Kids develop tooth decay for many different reasons – too many sugary foods, a poor brushing routine, not enough regular dental visits, or just poor DNA that makes their enamel more susceptible. You want to give yourself the opportunity to have the healthiest possible mouth and straight teeth, courtesy of modern braces, will make it easier for you to have strong, clean teeth and gums. 5. You’ll be happier and more confident. The last thing any teen wants is to be more self-conscious than they already are. Braces, however inconvenient they may seem now, are a ticket to major confidence. When your teeth look good, when they’re straight and gorgeous, you’ll be more likely to smile, and that will automatically boost your self-esteem and set you up for success for the rest of your life – personally, academically, professionally, and even romantically. 6. You’ll be thankful when you’re a grown-up. Invisalign braces are popular among adults because they can discreetly fix the crooked teeth they didn’t have the opportunity to address as a teen. Adults also pursue Invisalign for reasons beyond aesthetics. Maybe they have jaw pain from grinding their teeth or TMJ problems. Maybe they’re tired of misalignment that makes them more susceptible to tooth decay. If you take the time to treat all these problems as a teen, it sets you up for an adulthood of good oral health. Any teen will be thankful to know they don’t need braces but many adolescents do need them, and that’s a good thing. You will look better, feel better, speak better, and eat better after your teeth and jaw have been put into alignment. Schedule a consultation at Roberts & de Marsche, the orthodontic practice serving Center City, Philadelphia, and Lawrenceville, NJ, to learn more about youth braces.